One--Extra comfortable lightweight crochet hooks great for arthritic hand.Different type and size of knitting tools, make it convenient to use. Two--Smooth knitting with perfect good quality hook hand. Three-- Long life and without deformation because made of high quality material. Five-- cute knitting and crochet case bag is convenient for you to carry everywhere. Six--The flexibility in the cords allows for much easier work and faster completion time. Eight--These Afghan Tunisian Hooks are very well made. Smooth and flexible. Adjustable length of the extension, which allows more stitches. Nine--When working graphgan with one of these hooks, it just feels like butter a you don't here the squeaking noise as much as you do with metal hooks. Ten--A great gift for your mom,wife,aunt,sister,daughter,friends and all crochet lovers. Smooth surface of afghan crochet hook: bamboo crochet have smooth surface. so handy of the crochet hook that no worry snagging of the wool yarn, moveable stopper with adjoined plastic cable for maximum knitting or crochet project flexibility. These hooks are a very functional set and a great value, giving lots of flexibility with projects (e.g., increasing size to add flare, rather than adding stitches). The head shape is the Bates style rather than the Boye style. Easy identification of crochet needle set. The size of 12 different afghan knitting needles: 3mm, 3.5mm, 4mm, 4.5mm, 5mm, 5.5mm, 6mm, 6.5mm, 7mm, 8mm, 9mm, 10mm, metric size is permanently marked on crochet hooks. All the different sizes of afghan crochet hook so you can get gauge without having to purchase several other sizes. The cords are long enough to accommodate an entire afghan, but lightweight enough to work on a small project as well. Carbonized bambboo Material:bamboo is so much nicer then metal or aluminum .through carbonization process,the needle of carbonized bambboo crochet hook is more sturdy and hard,and the tube of the tunisian crochet hook is plastic,NO worry about the crochet set for beginners will snagg of the fabric,sweater, scarf ect. When working graphgan with one of these hooks, it just feels like butter a you don't here the squeaking noise as much as you do with metal hooks. Afghan Tunisian carbonized bamboo crochet hooks is not only suitable for an ardent crocheter, but also for a beginner set,suitable for making garment, hammock, like baby bed blanket,bed bedspread, jumper ect.The cables are long enough for almost any project. 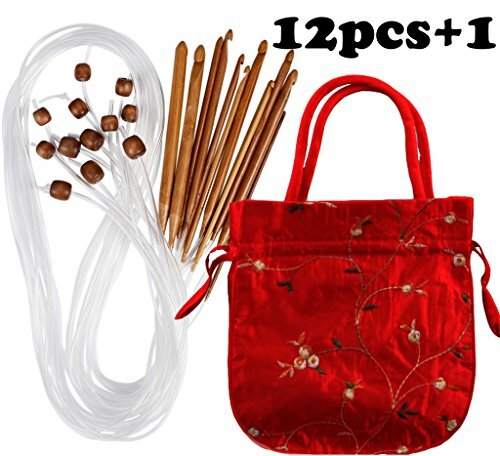 Crochet needle set worth to try for a Tunisian crochet beginner!